I am becoming star draped. My circumference rotates around victim blood that circles interiors. Laura Vena’s x/she: stardraped consists of a series of overlapping journeys—spiritual, cultural, linguistic, cartographic, geographical, psychic—mapping onto what was and has become the landscapes we know as Los Angeles and Southern California. Her long poem calls upon the ancestors, upon myth, upon the natural world itself, as its lyric speakers convey the depth and richness of their exploration and the immensities of the worlds they move through, stating towards the collection’s end that “I have learned the language of the winds and to hear what’s whispered below / Learned the light offered me / To this vastness I submit.” Vena’s poetry in x/she: stardrapedrepresents an impressive new contribution to the ever-expanding body of contemporary American poetry and ecopoetics. One of the poem’s jobs is to activate history, to make the stories that lie beneath our feet live to us again, to situate us in relation to each other, and to the trees and animals we live among. In Laura Vena’s x/she: stardraped,we move in a landscape whose depths are constantly sounded, so that we may scrape beneath the asphalt to the source. Thus, we locate ourselves in the eternal drought, drink, and by drinking in the testifying poem, are led to witness. 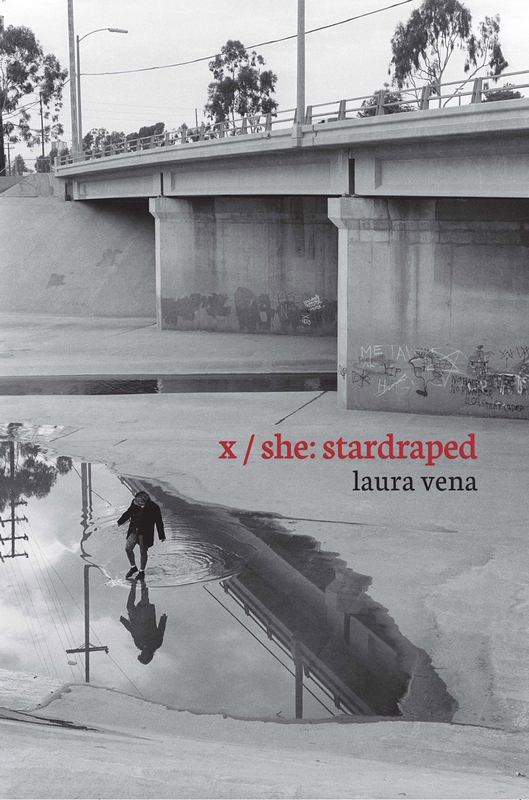 The poetic novel x/she: stardraped is set in rich layers of Los Angeles history, and Laura Vena skillfully liberates language into water, into a kind of automatic musical flow, as the story bears witness through the eyes of a goddess, the liberation and reclamation of a once-contained urban river. El libro x/she: stardraped condensa un vasto y complejo viaje poético retrospectivo. Movimientos que acuden desde un presente, acudiendo a tecnologías de la visualidad, a excavar las ruinas y las catástrofes humanas en el interior de un mapa territorial preciso que mutó debido a la violencia y a la voracidad. Con una sorprendente velocidad estética se reponen paisajes, cuerpos ancestrales, detalles de una naturaleza elocuente que vuelve a resonar entre los resquicios más líquidos de la escritura poética: su particular cascada de palabras. Hubo un pasado. Como si estuviésemos ante una pantalla que no cesa de emitir imágenes, se despliega, a la manera de un caleidoscopio, un proceso arduo de restitución de los cuerpos perdidos y oprimidos por el silencio de la historia. Expulsados por la codicia. Laura Vena construye una épica solidaria que busca unir tiempos, rescatar cuerpos y restituir la belleza inefable del agua en sus palabras. Like Gloria Anzaldúa’s Borderlands/La Frontera: The New Mestiza and Theresa Hak Kyung Cha’s Dictee, Laura Vena’s debut x/she: stardraped locates and constellates the cultures and people that form SoCal’s bifurcated history. The Old confronts the New and remembering gives way to transformation. The body bears history’s scars and Vena’s sublime book is a transcription, on oration, an archive of living in/among borders, of being emancipated into a cross-current of procedure and the lyric. x/she: stardraped is a beautiful offering to goddesses, lovers, and poets. Twilit and sun-soaked, double-crossed by both rivers and drought, simultaneously edge and center: Southern California truly is that dreamland where the imagination goes to die. Except that, in Laura Vena’s x/she: stardraped, this infernal paradise is transformed into the only terrain from which we might unearth and disentangle the reasons why our culture so longs to hasten the end of history. “What atrocities people this body.” For the consciousnesses populating x/she: stardraped, this is neither a question nor a proposition. It is the precise, present condition of all American being. Catastrophe our nature may be, yet Vena and her peregrinas wisely recognize that there’s real risk in straying too far from the paths ancestry has put down. A relationship with others beyond even empathy’s conception still necessitates a self — one whose articulation can be found in the shattered lyricism that makes this text (part codex, part confessional poem, part pulp prophecy) so extraordinary. 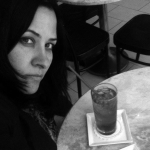 Laura Vena is a writer, translator, teacher, animal activist, and editor whose work has appeared in Bombay Gin, Super Arrow, Tarpaulin Sky, In Posse Review, The Dirty Fabulous, Antennae and elsewhere. She is the winner of the 1913 Press First Book Prize by John Keene for her manuscript, x/she: stardraped and has been nominated for a Pushcart Prize by Debra di Blasi for an excerpt from the same book. 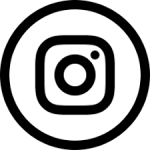 Laura holds an MFA in Creative Writing and Critical Studies from CalArts. She is interested in works of a fantastic nature, as well as those that investigate the ethical and aesthetic considerations of representation. Laura is the Co-founding Editor of the art and text journal Two If By Sea (coming soon), Fiction Editor at Entropy Magazine, and Founder and Creative Director of Blockhead Brigade, an organization that seeks to help Pit Bull type dogs & their families in need.